The first time my house flooded there was no warning. I had my parents living with me as they were in the process of building a new house. 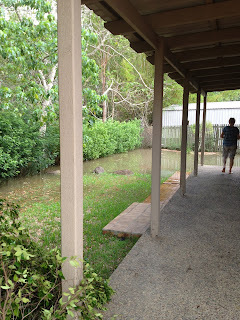 There was an afternoon of torrential rain, the sewage main backed up through the house while we were watching television and before we knew it we had to pick up our toothbrushes and make a run for it. Today we're sitting in the house again with too much time to prepare. The Burnett River is set for record breaking levels. During the GREAT FLOODS of 2011 I didn't see a drop of water from the storm water drain that runs at the back of my property in my yard. This morning I have my own river views and a pool. It came up in the night. Last time I lost all my shoes, some furniture, an entire house of floor covering and other bits and pieces. This time all my shoes are up high, shelves are all emptied, all furniture is on blocks and crates and the piano (which survived in 2008) is on a trolley ready to roll outside. Violin, viola and other precious things are in the car ready to go. I also have made a preliminary call to my insurer to start the ball rolling if need be. In other words, I have been fortunate this time to be able to be as prepared as I can be. There's no holding back a river. I saw the terrible flooding on the ABC, I hope you and all your things and people are safe. We do live in a land of drought and flooding rains. Stay safe. I hope there is little or no sewerage this time.